Think of a house as a living creature–I know I do—and it turns out that houses have auras too. I always saw this home’s aura as navy blue. Perhaps it’s because at the time of renovation we were living on a boat where, against the teak, every stroke of navy was successful. It only follows that I would do much the same with the house. 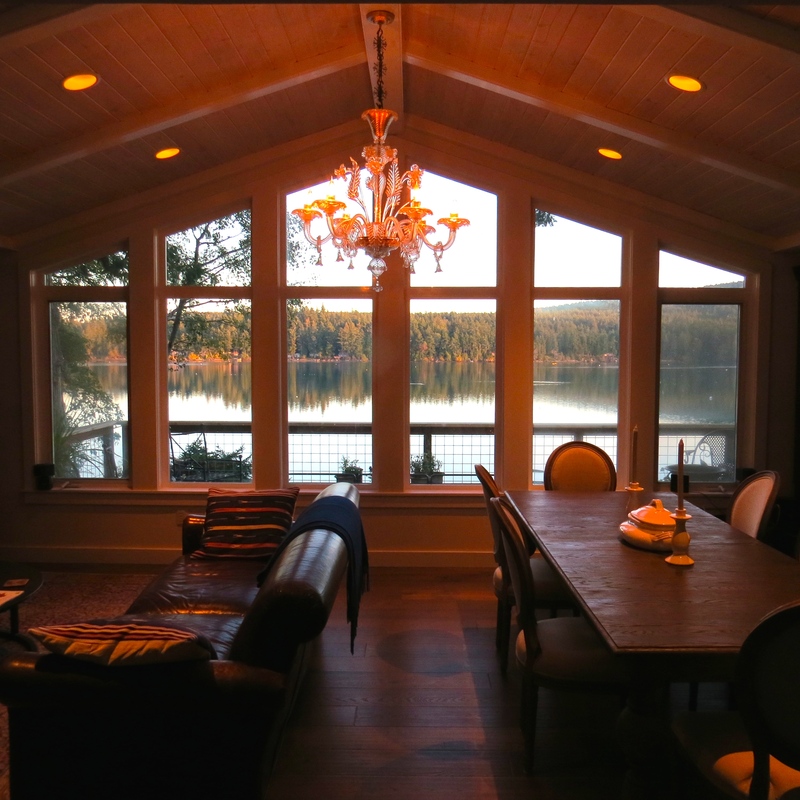 The hardwood floors we put in are a rustic gray/brown, reminiscent of the weathered docks at Friday Harbor Marina. The window (pictured) is our artwork, just as we used to sit and view sea and sky from the boat’s upper helm. I knew that in doing this house, nothing should detract from the view by day. And that on velvety dark nights, we would just need a little warmth–what color, textiles and lighting can do–until sunup. Navy is the only blue, to my mind, that is warm at night and in winter. Even in August, it would be a stretch to read Mediterranean blues, turquoise, aqua, and seafoam into The Pacific Northwest. French blue would leave us chilled for half the year. Regardless of the season, our beach experiences are about wearing something sensible on our feet and building bonfires. The sand is not a hot blinding white, but soft and muddy. Our beachscape is described by sea grasses, driftwood logs gone adrift and come ashore, oyster shells, and rocks. Like a good espresso or black coffee, navy blue works year round. And with it, some reds, taupe, and beige. Think: Pendleton blankets. This is where nautical meets North Coast Indians. The rest was easy: pillows and throws, table linen, pottery and porcelain, predominately in navy blue. The color I put my confidence in, because early on, the house and the land and sea whispered navy to me.